Shymkent is the third largest city in Kazakhstan and is situated in the south of the country near to Uzbekistan. The new “Nursat” administrative and residential district has been established to meet the growing population of the city. This offers space for around 30,000 inhabitants over an area of 370 hectares. In winter there can be icy temperatures – the record is below -30 °C. It is therefore essential to have an absolutely reliable heating and hot water supply system. For this reason a giant new heating plant was built with five Bosch hot water boilers. They can provide the new district with up to 190 MW of heat. Supply is provided on the basis of demand and the weather. 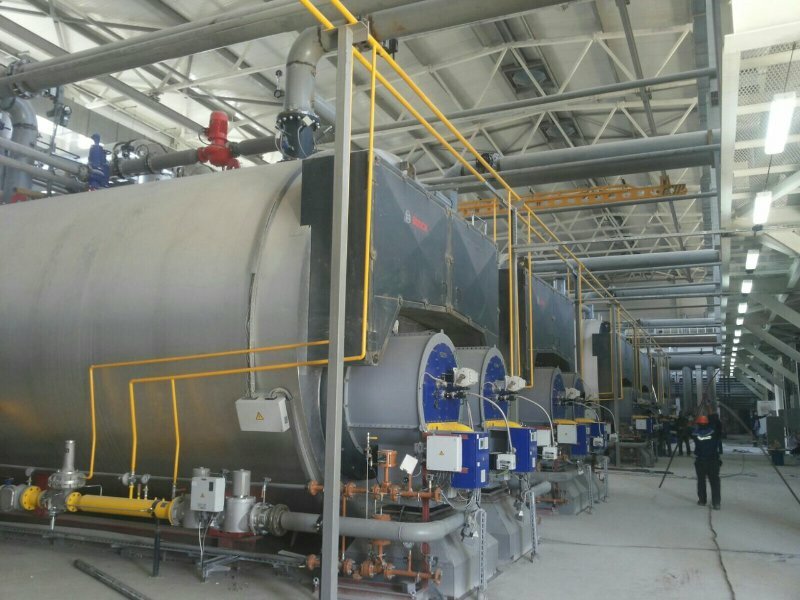 Whether at peak load times or at low demand, the double-flame tube boilers run efficiently and with low emissions over every load range due to the large modulation range of 1:20. Thanks to Bosch control technology with sequence control, the boilers can be switched on and off individually and automatically. At least one of the boilers is generally in standby mode and can support the heating network at any time. Dual-fuel burners offer additional security. If there are supply shortages at the natural gas supplier, it is also possible to operate the system with light fuel oil. But the project is not only impressive regarding its size, reliability and efficiency. 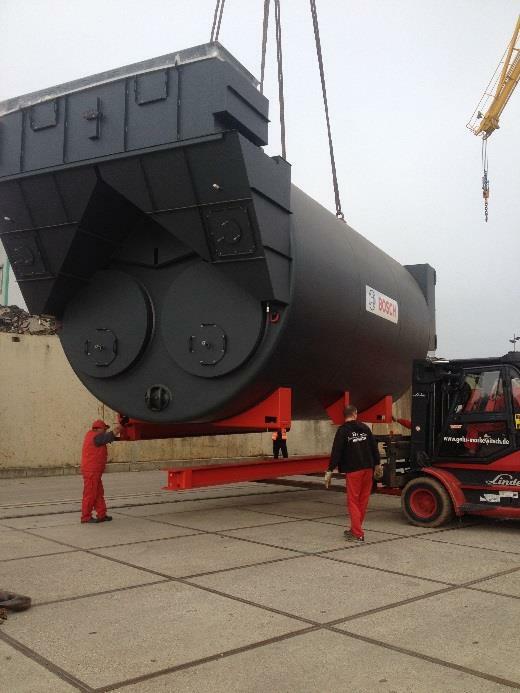 The transport of the large boilers was also considerable: the steel giants with a transportation weight of approx. 85,000 kilos/each, travelled around 7,200 kilometres to their destination. Starting at the Bosch factory in Gunzenhausen (Germany), they travelled to the port at Roth and then onwards via the canal to Rotterdam (Netherlands), and from there to St. Petersburg (Russia). 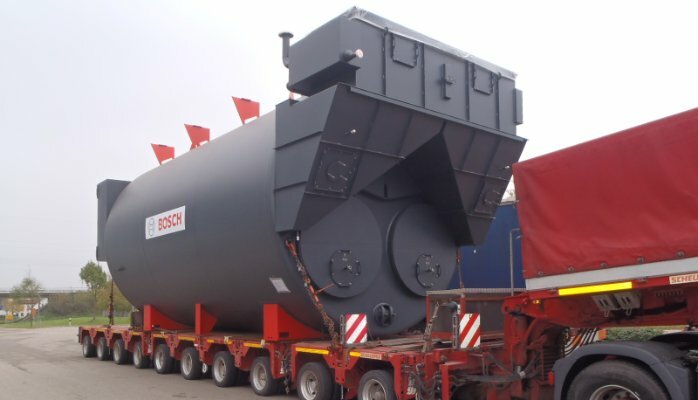 When they arrived there, the boilers were transported 4,000 kilometres by road through Russia and Kazakhstan. Due to their height of around five metres, power lines had to be temporarily dismantled. The weather conditions were also a great challenge for the experienced haulage company, Instar Logistics. Since the delivery took place during the winter months, the roads were partially covered with snow and ice. The boilers reached their destination in Shymkent safely after a total transportation time of eight weeks. They have since been installed there, and the first two have already been commissioned by Bosch customer service.